Testing patterns for the holidays has been my favorite recently. When I tested the new Holly dress from Made for Mermaids (affiliate link) I loved my first one so much that I just had to make another. The first was this pale blue and cream floral cotton lawn from Raspberry Creek Fabrics. (Its sold out currently but check here for more amazing fabrics for this dress). Holly has tons of sleeve options -7 to be exact (because you have the option to add elastic in each length). I did the 3/4 option here and love it. This pattern is also incredibly easy to get the perfect fit. 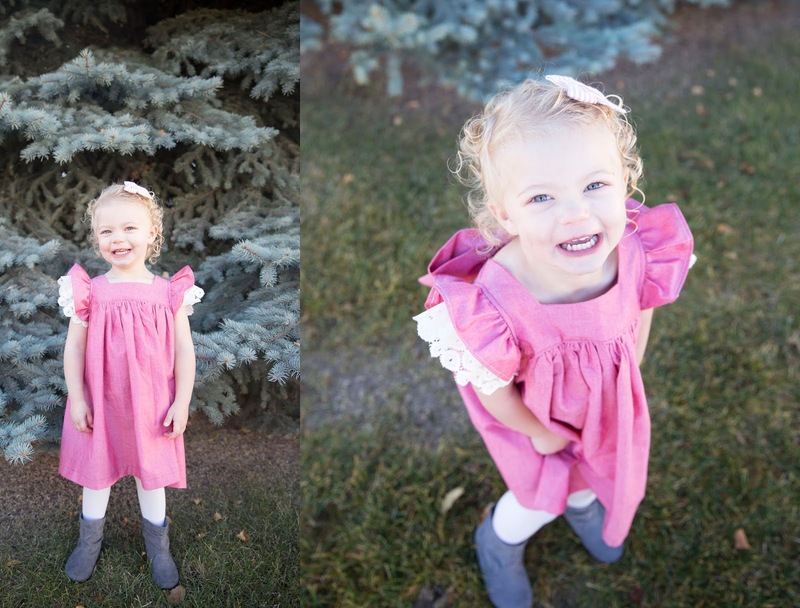 Lyla is 2 and average 2T measurements except for height which is 3T and its very easy to just add length. Cotton lawn is like softer, silkier, more drapey quilting cotton and it hangs perfectly. 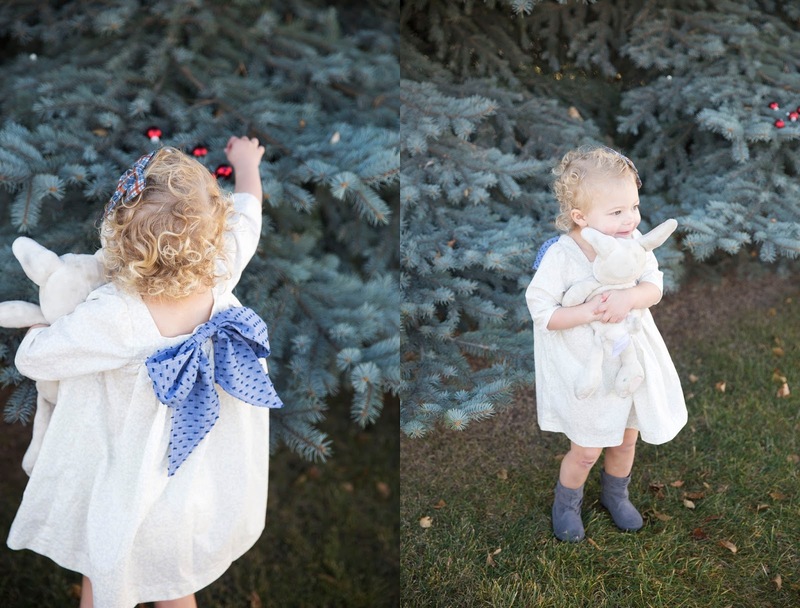 The bow is made of a beautiful swiss dot chambray which is trickier to sew with but so perfect as a bold contrast in the big bow. That bow. It kills me. Definitely my favorite feature! Because this is part of their Dreamy Holiday Collection I just had to make another with a Christmas party feel. This one is made in a strawberry red chambray from Raspberry Creek Fabrics. Its thicker and stiffer and gives the dress a fuller look and looks so beautiful with the flutter sleeve option. I decided with this one to kick it up a notch and give it the double flutter sleeve so I pulled out some lace and did the second flutter out off that. Granted, it is actually a stretch lace so it doesn't stick up exactly like its should but I kind of think the drapier lace piece gives it a little more whimsy that makes it so precious. 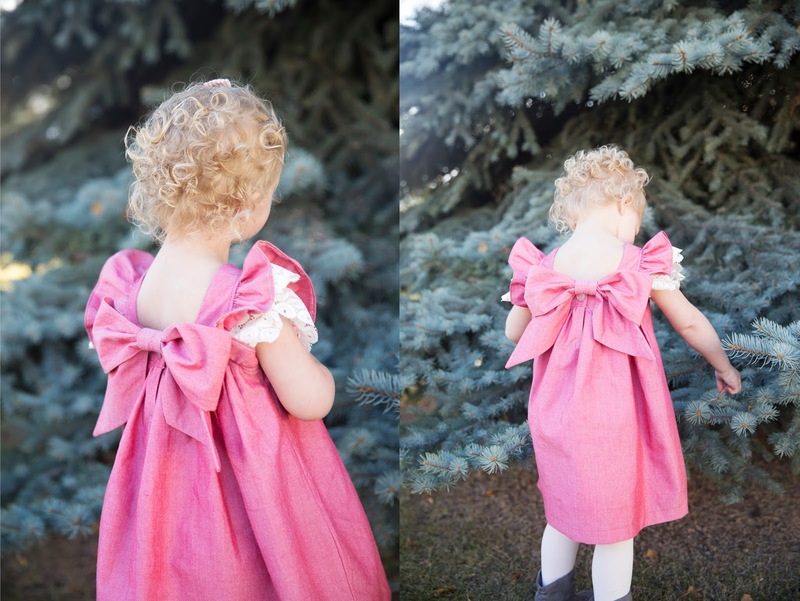 The bow totally makes this dress! The pattern comes together fairly easy and is a pretty quick sew depending on ability, but that big bow on the back makes it all look so much harder and high end and gives you a great feeling of accomplishment, because no non-sewing friend would guess you made it that afternoon:) It has a fully enclosed bodice so the inside can look just as good as the outside, which makes it feel top notch. And the bow is detachable for washing and you can just leave it off if its not your style. The only thing I am not obsessed with in Made for Mermaid patterns is that you don't get all the pattern pieces with the download. Anything that is a rectangle you get from a cut chart. (A chart that contains the measurements for you to cut out on your own.) I wish it just included all the pieces but other people tend to prefer this so you don't have to print as many pages which is a bonus, so to each their own! 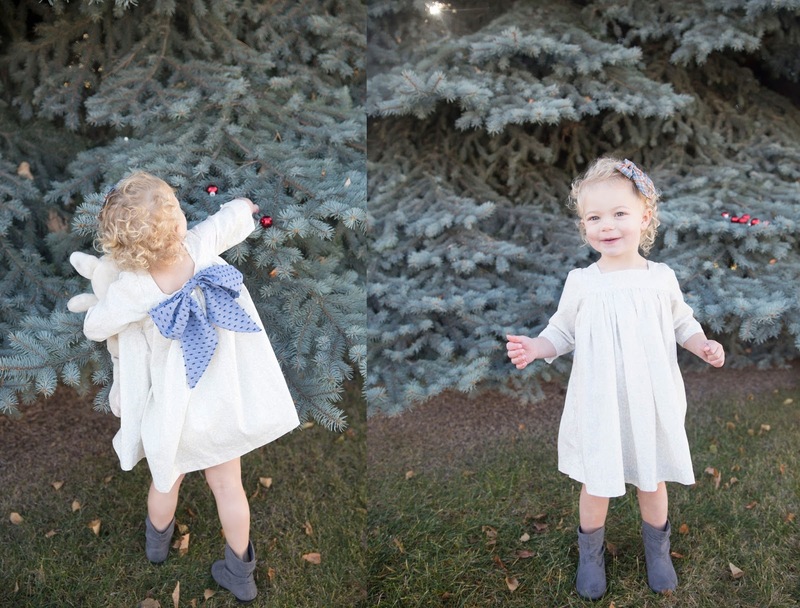 The back has a single button closure for easily getting on and off your little one. 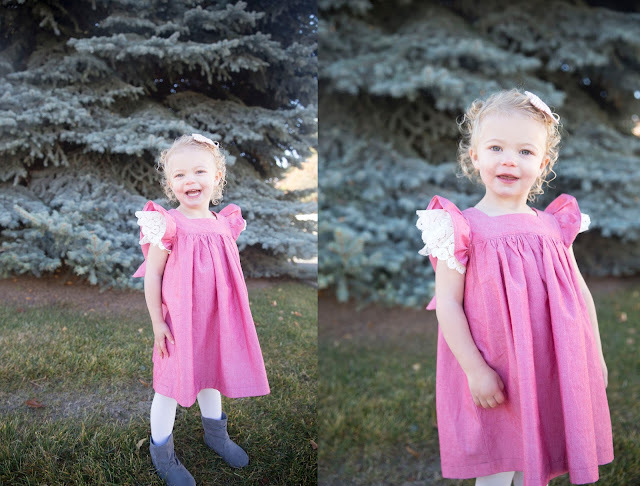 Holly also has options for ruffles on the bottom and and a top option so your little one can pair it with their favorite leggings or jeans. I want to make a top next with long sleeves made out of plaid flannel! And it goes up to size 14 so you can make your bigger kids one, too! Its on sale for $7.00 here until the 20th so you even have time to sew up the perfect dress or top for Thanksgiving!